Which is leg and which is shadow? 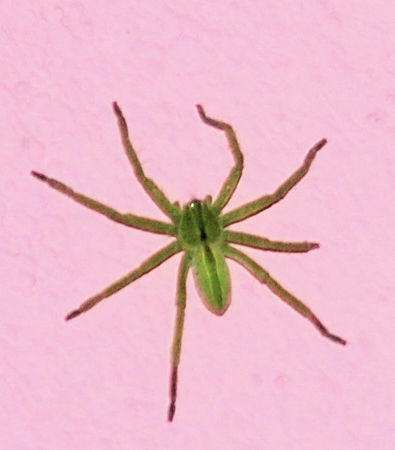 I thought this was a spider but it isn’t. It belongs in fact to a group of creatures called Opiliones and is called a Harvestman because it appears at harvest time. Of the other names for it I most like Grandfather Greybeard. 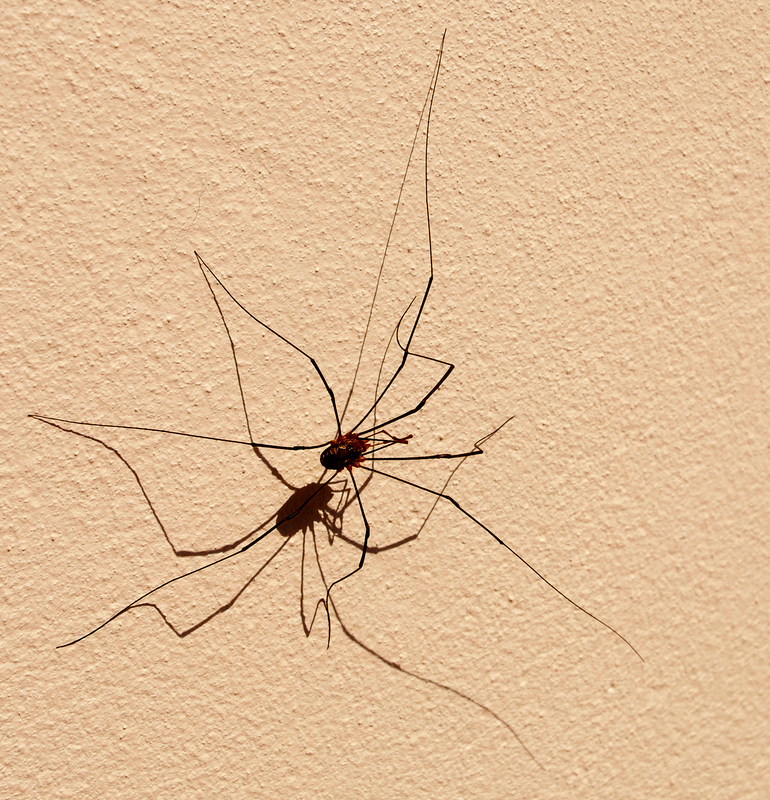 In America it’s called Daddy Longlegs but that’s the name we give to a crane fly in the UK. 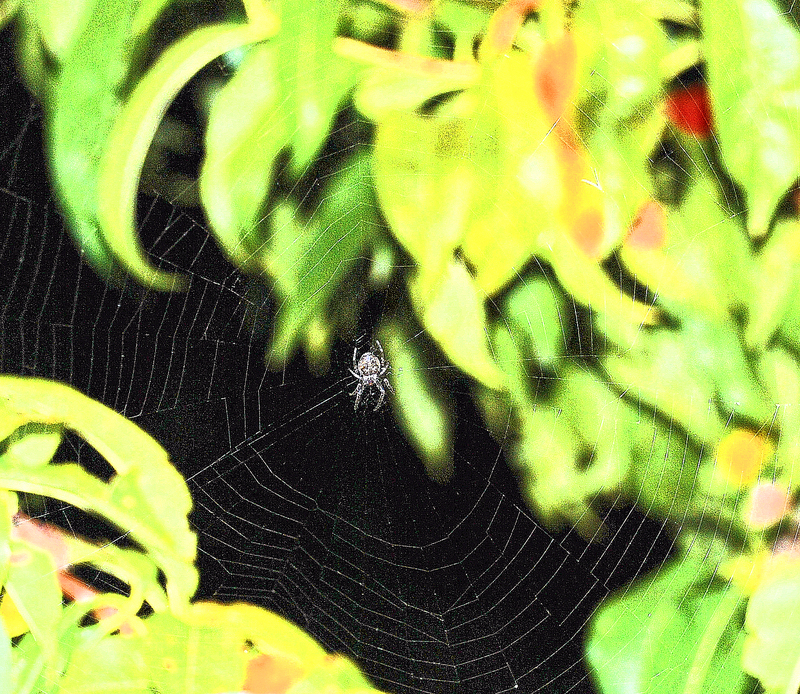 Going out to pick peaches in the dark, I was rewarded by finding a perfect spider’s web stretched across the space in the middle of the tree. 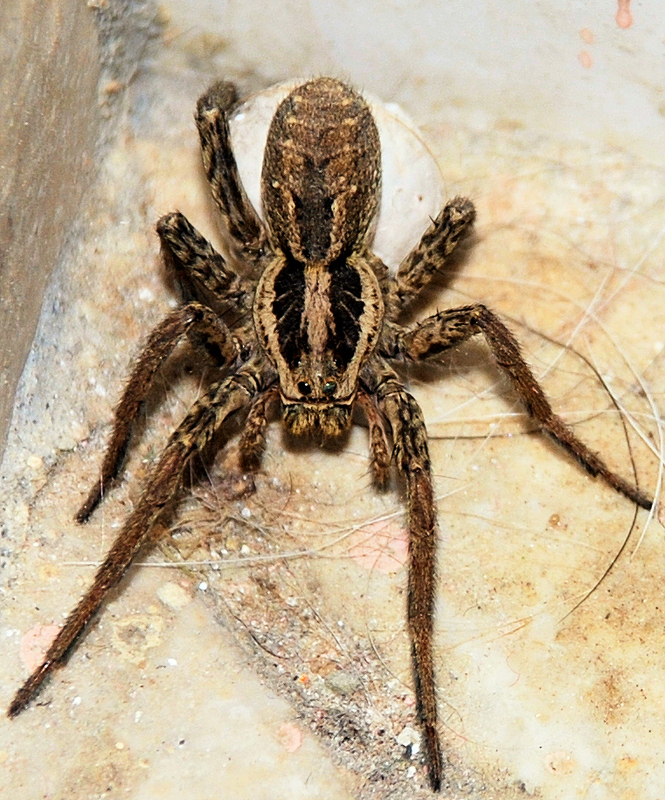 I must have dazzled the poor spider with my torch and camera flash, but it didn’t even stir. Just waited, patiently. A spider peers up from the corner it has backed into. Behind it is the egg sac which it takes around like a wheelbarrow in reverse. Mother and offspring represent a great many dead flies in the future so – welcome, friends. This spider’s stake in the future is very fragile. 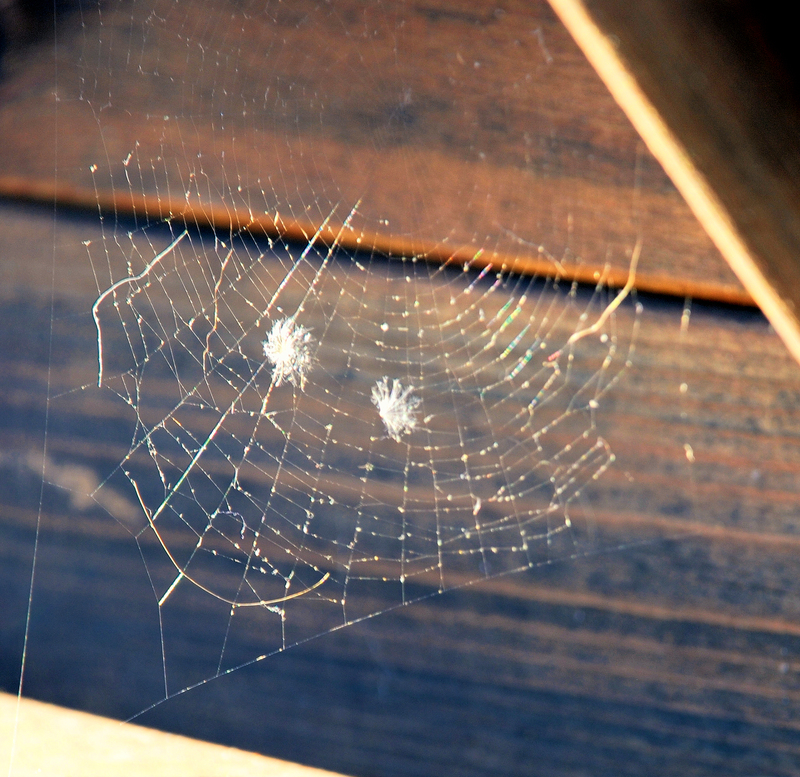 Its egg sacs are hanging in its web, which could be brushed away at any moment. This is a corner of our above-ground indoor pool where I swim in the winter. 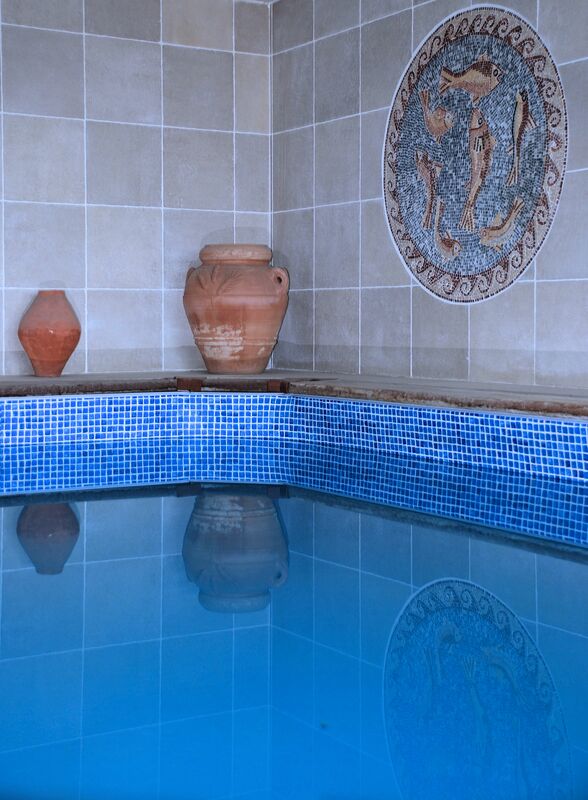 The temperature of the water, which we don’t usually heat, averages 19 degrees C. Bearable but not luxurious! Unlike the mosaic above, it contains no fish. Nothing like the range of wildlife that ends up in the outside pool, of course, and what goes in here gets fished out pretty sharpish; I run a tight ship. Very usefully, on two occasions I’ve found a queen hornet struggling in the water, though not for long as she was quickly put out of her misery. More convenient than having to chase her up the windows and round the back of the pictures!